Tees Active look for brand standard flooring solution. We were approached by Tees Active to specify a flooring solution that would offer them a consistent brand standard throughout their sites as well as a relatively quick installation. The sites we were asked to look at initially were Thornaby Pavillion and Splash Leisure Centre. Each site had a different budget and various timescales. 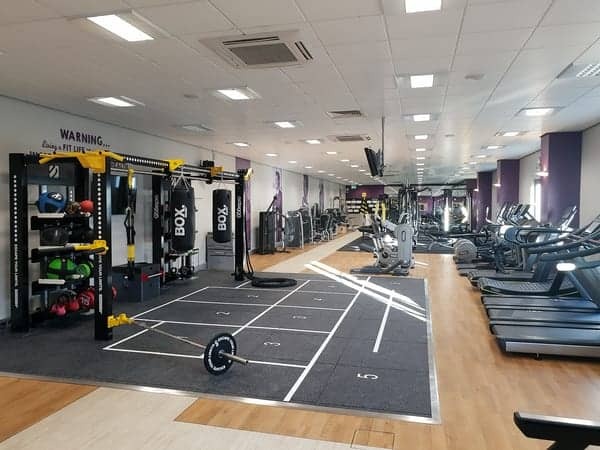 The flooring installations for Tees Active were part of a major refurbishment including new Technogym equipment and branding. Tees Active wanted to avoid closing their centres for prolonged periods of time so we had to come up with a flooring solution that would avoid any unnecessary work and they were ideally looking to keep their existing floor in place. We set about researching the market to find a flooring solution that would both meet their requirements as well as budget. After much research was completed the chosen products for Thornaby Pavillion were a 15mm Rephouse tile for the functional area and a 27mm Regupol rubber tile for the free weights area. Both products matched Tees Active’s budget well and offered them the performance and aesthetics they required. Splash Leisure Centre, which had slightly differing requirements chose Gerflor’s Creation 70 Clic vinyl plank for the main gym and a 27mm Regupol rubber tile for the free weights area. Both Thornaby Pavillion and Splash Leisure Centre chose products that would enable them to keep their existing floor in place without the costly exercise of ripping up and disposing their existing floor. Both sites were completed on time and on budget. The feedback has been very positive and Tees Active are happy with their new up-to-date floors. We are also working on a third project which we hope to complete by the end of 2018. Tees engaged with Recreational Coatings early in 2018 for our Activ8 Health & Fitness refurbishment and re-kit. We found the service provided from the initial assessment of the gym floor requirements, quotation to installation to be of an excellent professional standard. The installation team worked effectively on site with other professionals such as Technogym and Escape to ensure the project timescales were met. The quality of the flooring at both Thornaby Pavilion and Splash has transformed the look and feel of the gyms due to the high quality of the fitting and finish.